The Redemptorists » Ash Wednesday: Tension — the stuff of life! Today’s first reading from the Prophet Joel and the Gospel reading from Matthew are in tension. Joel is asking us to repent by fasting and weeping and mourning — offerings and libations for the Lord, i.e. public displays of purifying our hearts. In the Gospel, Jesus is telling us not to perform righteous deeds in public, and yet Ash Wednesday is probably the most public demonstration of our faith. People wear the ashes to work, play, school, etc. Are we doing what Jesus told us not to do? Or are we more in line with the Prophet Joel? Hmmm … What a conundrum! Externals mean a lot. What we wear and how we present ourselves says something about who we are. Yet we’re complex. We’re more than our external presentations. Every day we discover more of who we are, and in this life (a portion of eternity) we never fully understand who we are and sometimes our actions surprise people, hopefully for the better. So today, let’s get our ashes, but let’s also remember the most important aspect of our being is both how we treat each other and creation. We need to reverence each other because the Spirit of Jesus — the Risen Christ — dwells in each person. In addition, we must reverence creation and care for it because God, not us humans, created the universe. Receiving ashes reminds us that we are not God, but creations of God through the cooperation of our parents who brought us into God’s world. Yes, let us get the ashes, a public sign of our acknowledgment that we are God’s creation, but more important let us pray in private today. Prayer doesn’t change God but it does change us. And let us do something good that reverences other people and creation without telling anyone. And if we do tell someone, OK, it means we’re human and God still loves His creation. 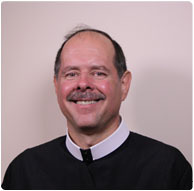 Deacon Jim professed vows as a Redemptorist in 2008. He is serving his diaconate year at St. Martin of Tours Parish in Bethpage, NY, and expects to be ordained to the priesthood in June.